Alice Adam Ltd. was founded in 1977. Alice Adam is a private dealer specializing in significant German Expressionist prints and drawings. More than forty years of experience in this field have established Ms. Adam as an authority on the artists, as well as the various movements that define this period of German art. The Brücke, or the "Bridge", was the very early and highly important group of young artists who worked together in Germany during the years 1905-1912. Among those included in the Brücke were Ernst Ludwig Kirchner, Erich Heckel, Karl Schmidt-Rottuff, and Emil Nolde, etc. These artists produced the intense body of work that was to so drastically alter the direction of twentieth-century art. Shortly after the Brücke came the wave of Independent Expressionists, who worked simultaneously from approximately 1914-1930. 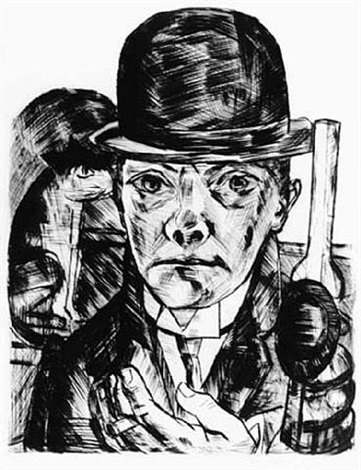 The artists from this group whose work is of greatest consequence are Max Beckmann, George Grosz, and Otto Dix. Their artistic efforts from this period offer some of the most forceful and visually effective stabs against the prevalent socio-political conflicts and injustices of the time. In the 1920's the theories and style of the Bauhaus, Constructivist, and Dada movements ran parallel, and often converged. Artists such as Lyonel Feininger, Wassily Kandinsky, Paul Klee, El Lissitzky, László Moholy-Nagy, Oskar Schlemmer, and Kurt Schwitters, all participated in and contributed significantly to the radical thought and technique that ultimately defined the above artistic schools. Further areas of interest include the Austrian Expressionists, namely Egon Schiele, Gustav Klimt, and Oskar Kokoschka, as well as artists whose work influenced the early period of Expressionism, such as James Ensor, Paul Gauguin, and Edvard Munch. We serve major museums and serious private collectors throughout the world. It is our aim to find and make available the rare and historically important works by age above artists, all of whom are acknowledged masters, having created some of the most significant art in twentieth-century Europe. Our inventory is extensive and we welcome inquiries. Emil Nolde, Mann und Weibchen, Woodcut. 1912. Alice Adam was born, raised, and educated in Switzerland. During her studies she was at the auction house Kornfeld & Klipstein in Bern, and Dr. Eberhard Kornfeld was her mentor. In 1965, she arrived in Chicago and became the Director of the Allan Frumkin Gallery, Chicago. During her early American years, she was encouraged and inspired by Dr. Harold Joachim, Curator of Prints and Drawings at the Art Institute of Chicago. Emil Nolde, Segelboot, Woodcut. 1910.